Nawada: While people are often seen begging for a bed in government hospitals due to its shortage, such is not the case, seemingly, with one government hospital in Bihar’s Nawada district where stray dogs were seen leisurely resting on patient beds raising concerns regarding the public healthcare system in the state. 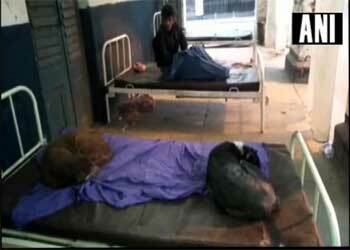 According to a patient in the hospital, they are not assigned beds since they are mainly occupied by stray dogs. “The hospital authorities refuse to give us bedsheets. These dogs enjoy the comfort of bedsheets,” a patient said. When asked about the situation, the hospital authority stated that they are going to look into the matter and punish the ones responsible for this. “We will ascertain how this happened and who’s responsible for it,” said Umesh Chandra, Incharge, Civil Surgeon. This is not the first time when questions have been raised over the healthcare services in Bihar. In July last year, the Nalanda Medical College Hospital (NMCH), which is reportedly considered as the second-largest government hospital in the state capital, was seen flooded with rainwater following heavy rainfall. Patients were seen lying on the bed in the Intensive Care Unit (ICU) while the room was inundated with rainwater. Meanwhile, fish were also spotted swimming in water inside the ICU. See how much they love animals \’they are real animals lovers or the Animal right activists Den it is ? What is use of spending crores of rupees in establishing MEDICAL COLLEGES & hospitals , when can\’t have basic maintenance. I think public toilets elsewhere is much clearer and hygienic than some of MEDICAL COLLEGE TEACHING HOSPITALS. HOSPITALS NEED NOT BE DUMPING YARD OF THE DESTITUTES. OR PLACE FOR SOME ONE FOR FREE FOOD AND STAY.